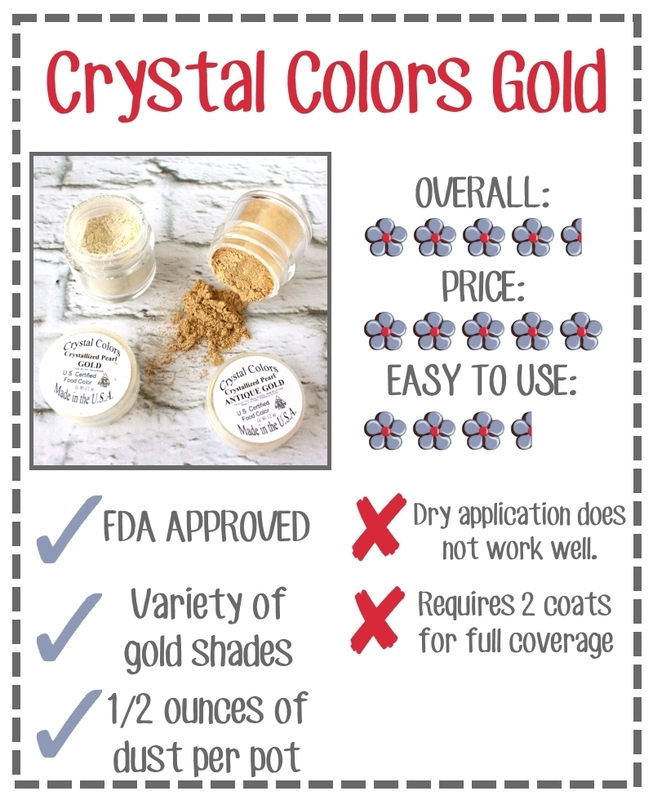 Crystal Colors dusts are FDA approved and there are at least 3 different shades of gold dust that I found. It comes in GOLD, ANTIQUE GOLD, and BLUSH GOLD. I got the first two...and now I wish I would have ordered a blush gold too! The first thing that I noticed is that the dust containers are substantially bigger than the tiny luster dust containers I'm used to. It looked like it was at least twice the size and completely full of dust. I did an online ounce to grams conversion and it turns out there is about 14 grams of dust in each container. (Most of my luster dusts are 4 grams.) So...that's nice....but does it work? Let me show you. I normally paint dusts on wet, so I tried that next. I poured a little bit of dust into the lid of each container and added enough water to make it into a wet paste (about the consistency of latex paint.) I painted both colors on the bottom halves of each cookie. 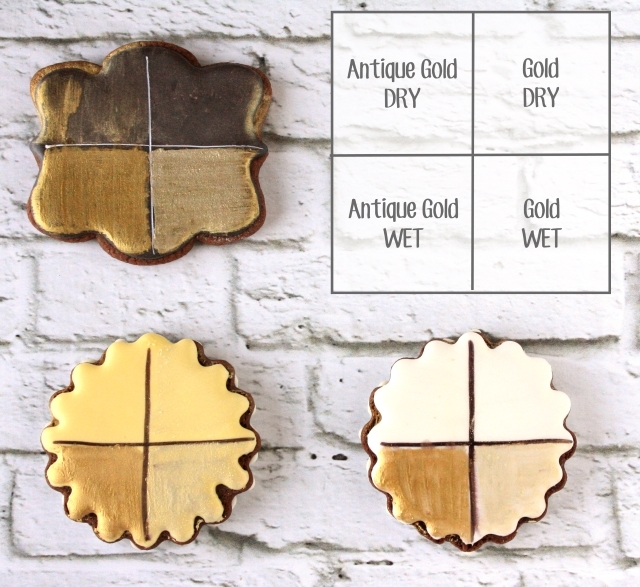 They both looked a little patchy, so when they dried I added a second coat of wet gold to each cookie. 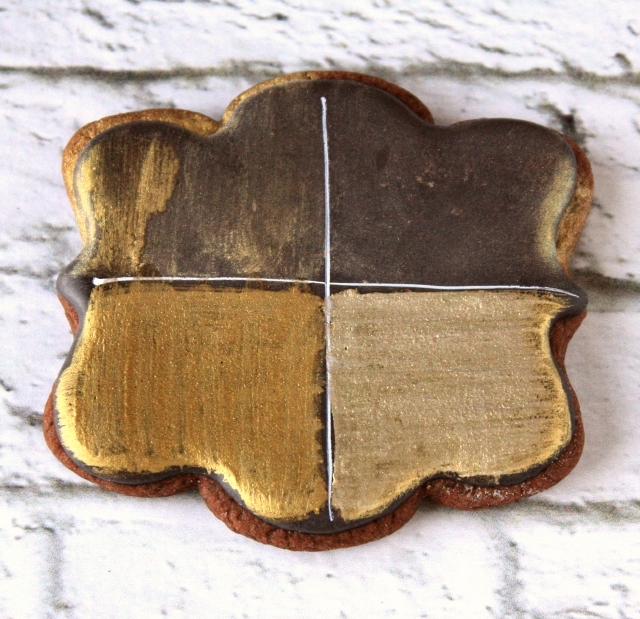 After 2 coats, the white cookie is the only one that still looks a little thin. I was really surprised at how well both of these golds covered the black icing. In fact... I may re-think my "gold as a base coat" strategy and go with black instead. Want to try some for yourself? 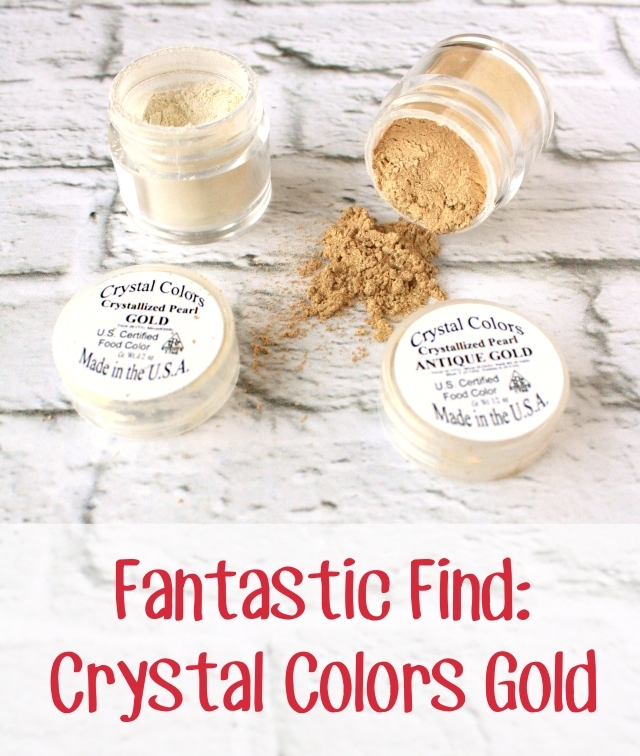 I've got a container of Antique Gold to give to one of you! Just click that Easy Entry button below by midnight on Friday, March 18th to enter. What do YOU think? Have you tried them? What's your favorite shade of Crystal Colors gold dust? Can't wait to see if you won? You can get the Crystal Colors dusts HERE.